While toddlers can be naturally restless, a case of the night sweats is bound to add more discomfort and get in the way of a peaceful night’s sleep. If you have ever noticed that your child’s bedding is soaked in the morning, you are not alone. It is due to quick-activating sweat glands that react more sensitively in toddlers when compared to adults. A child has a higher sweat gland to surface area ratio. What Causes Excessive Sweating in Toddlers? The main factor of night sweats is simply becoming overheated. This is one of the most common causes and does not usually require a visit to the doctor. Pay attention to the number of blankets that you keep in your child’s bed, along with what pajamas you choose. Being cozy and warm is indicative of a restful night, but as the body reaches a deep rest, it becomes naturally warmer on its own. Try to select bedding and pajamas that are made of breathable fabric. Cotton, linen, and rayon are some good options. It is a good idea to also utilize a ceiling fan or window if the season is appropriate. Having better air circulation will keep the humidity in the room low. If you notice that your toddler is still sweating excessively, even though the above factors are taken into consideration, take his/her temperature. A fever can cause night sweats, which is the body’s natural defense mechanism to rid itself of any toxins. If you feel that a fever or any other kind of illness could be causing the sweating, a trip to the doctor would be the next step. Sleep apnea could be another potential cause. This happens when the airway is temporarily obstructed, resulting in the suspension of breathing. The body will then form sweat to combat the symptoms. Another thing to consider is what you are exposing your child to during the daytime. Sometimes, nightmares can be linked directly to night sweats. If you are over-stimulating his/her imagination, it is possible that nightmares can occur. Try to limit television time before bed and opt for reading a bedtime story instead. Place a nightlight in the bedroom and offer the comfort of a familiar stuffed animal or toy. Nightmares are inevitable sometimes, so having a support system is also going to be helpful. Reassure your child that things are going to be okay, and explain what happens when we dream. How Do Doctors Determine if Night Sweats Are Illness-Related? While each case is going to be unique, your doctor will have to evaluate your child’s symptoms in order to determine if there is a larger problem with the night sweats. To do this, blood testing and physical exams are usually the first steps. The following are some symptoms that can appear alongside night sweats that usually indicate an illness: fever, rashes, itchiness, vomiting, diarrhea, gasping, and weight fluctuation. Follow your instincts and take your child to the doctor for a diagnosis if you feel that any of the symptoms apply. 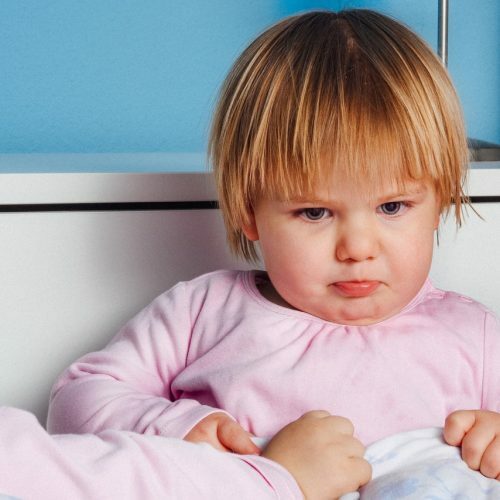 Sometimes, perfectly healthy toddlers experience night sweats that go away on their own. Your doctor will be able to determine if a treatment plan should be sought, or if your child will simply outgrow them. Medication can be prescribed by your child’s doctor if the problem is long-lasting. There are medicines that are able to lessen the amount of sweating (anticholinergic). Although this will not stop the sweat entirely, it could help to improve the situation by limiting the amount of sweat that forms. These medicines are to be taken orally. This kind of medication would help a situation where regular, mild sweating occurred. If you do not want to turn to a medication, there are also topical ointments that will provide the same relief. Most of them come in a gel or cream formula. These ointments act as antiperspirants, similar to an average stick of deodorant. Apply before bedtime, once every 24 hours. The substance is designed to block the sweat ducts. Another topical alternative is talcum antiperspirant, a powdery substance that can be used in the same way. These options are the most well-known for treating night sweats. In rare cases, the night sweats can lead to surgery on the sweat glands. This is extremely rare and will only occur when these glands are permanently blocked. Other rare and intrusive treatments are botox and electrical therapy, designed to suppress the sweat. Only in cases of maximum severity are these steps necessary. Before the problem becomes too persistent, there are some steps that you can take to relieve your child at night. As mentioned earlier, bedding is important. Do not pile on the blankets. Make sure that the ones you choose are made of breathable material. Change the bedding often, as well. Your child will feel more comfortable and get a more restful night of sleep when they are cleaned frequently. Buy a few sets that you can use interchangeably while you are washing the others. Opt for lightweight pajamas that will allow the same breathability as the bedding. Even in the coolest months, bundling your child up too much will likely result in overheating. Form a solid bedtime routine. If you feed and then bathe your child each night, he/she will be able to feel comfortable. When it comes to bedtime entertainment, it is best to go for lowkey options such as reading stories or playing with puzzles. If you overstimulate your child’s mind with television, the likelihood of nightmares is far greater. With these tips and factors combined, you are forming healthy habits for your child that will promote a good night’s rest. Choosing the right pillow for your toddler can also help. As your child grows, he/she will be able to do this routine alone, which is a great way to teach personal care and get started on the track of a balanced lifestyle. Remember, night sweats can happen to any child, and taking these precautionary measures is the best approach to preventing them from happening in the first place.